Web is increasingly present in the consumers’ lives and becomes an important information source to understand people’s opinions, tastes and trends. Even the appliance industry looks carefully at the web to orient its communication strategies. This is the case of Hitachi Air Conditioning, which for its new online spot has collaborated with socialbeat.it, an innovative platform that studies the conversations on the web to identify the greatest interest topics. 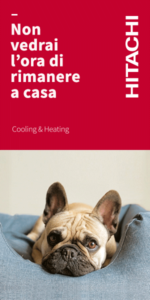 The spot protagonist is Gracy, the little French bulldog who, unlike what usually happens, prefers to stay at home instead of going out for the walk thanks to the presence of the Hitachi air conditioners that ensure the best climate during the summer heat. Why a French bulldog? Because at the moment it is one of the most popular dogs on the web. The spot was created and produced by Moma Comunicazione under Fabio Cattabiani’s direction. “For the Hitachi spot we have identified with extreme precision not only some particularly relevant topics for the social world such as pets and the hygge trend – says Stefano Ferrari, CEO of Moma Comunicazione – but also the relative reference communities to which we will address in the future with careful social planning and events on the territory that will allow us to continue to communicate with great effectiveness the Hitachi Cooling & Heating brand and the range of residential air conditioners”. The video has a duration of 30 seconds and is programmed on Google, Programmatic Advertising, Facebook and YouTube. A part is also conveyed through the 3b Meteo app. Besides, extra videos have been realized showing the backstage, and they will be published as special content on Hitachi Cooling & Heating’s social media channels.